It was a baptism that planted the seed for this store. (Some time ago now – that little baby is now in high school!) I was having a hard time finding something for her nursery which I could personalize. This wasn’t the first time that I’d searched for a religious-themed gift and felt limited by my choices. One thing led to another, and eventually The Christian Gift was born. I never know where I’ll find inspiration for new designs. Sometimes it’s an image I’ve made with my camera. Other times, the light bulb goes off when I read a Scripture verse. Interestingly, it might be a passage with which I’m very familiar but hadn’t considered using it as the basis for a design until then. 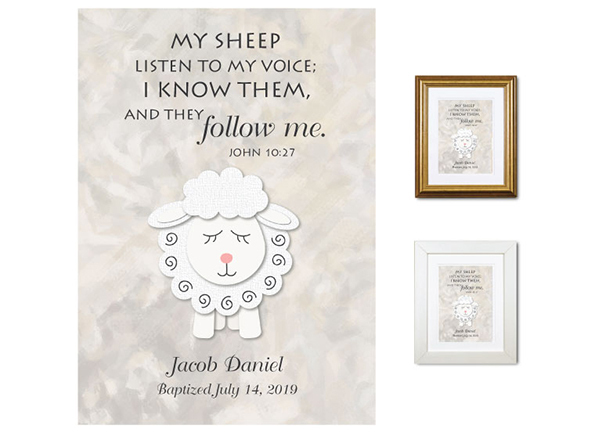 I’ve had two Scripture verses dancing around in my head for the past few months which I knew I wanted to use for new baptism wall art, but it wasn’t until a few weeks ago that I began kicking around ideas about how to support them visually. They’re both now completed and were added to the store today. One of them is pictured above. (It’s also available in three other colors.) I find the imagery of sheep recognizing the loving voice of their Shepherd to be beautiful. Here, it’s combined with imagery that a young child can appreciate.